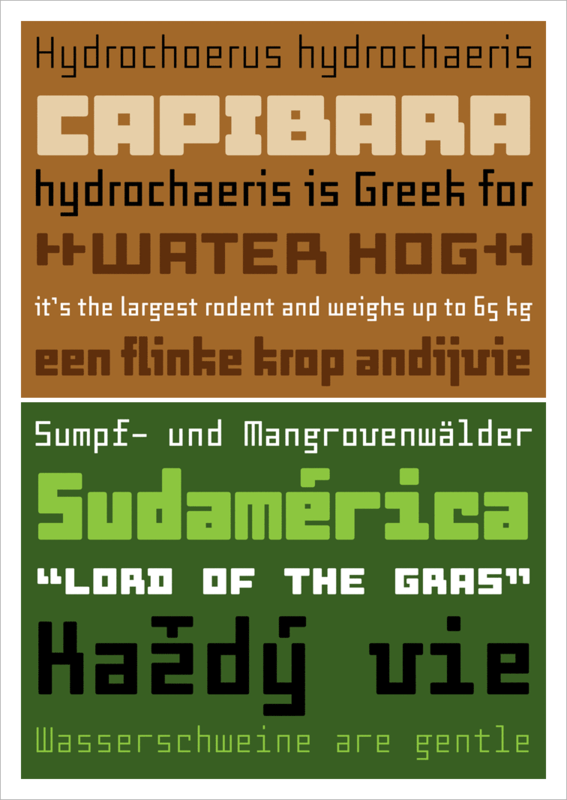 Capibara is a geometric typeface family constructed purely of horizontal and vertical strokes. The design echoes the typographic experiments from the early 20th century by Constructivist artists such as Theo van Doesburg and H.Th. Wijdeveld. Capibara manages to escape the harshness and coldness that characterises most geometric designs since all corners are gently rounded and it doesn’t adhere to a strict grid. The family comes in proportional and monospaced variants, all executed in five weights. Capibara has an extensive set of Latin characters that covers the majority of European languages. OpenType features provide access to many extras including small caps and different kinds of numbers.